The data logger features user-programmable Engineering Units and offset/gain calculations so input signals can be scaled to proper units being measured. For example, a water meter with a 4-20 mA output can be displayed as liters or gallons, etc., in the software graph and data. Negative current signals can be monitored and recorded, for a broad range of applications. Three different DC current ranges are available ±1 mA, ±25 mA or ±100 mA. 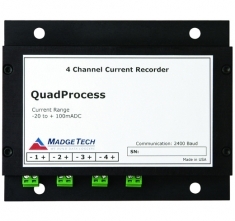 The QuadProcess can measure and record data for up to 32,767 readings per channel. The storage medium is non-volatile solid state memory, providing maximum data security even if the battery becomes discharged. The device can be started and stopped directly from your computer and its small size allows it to fit almost anywhere. 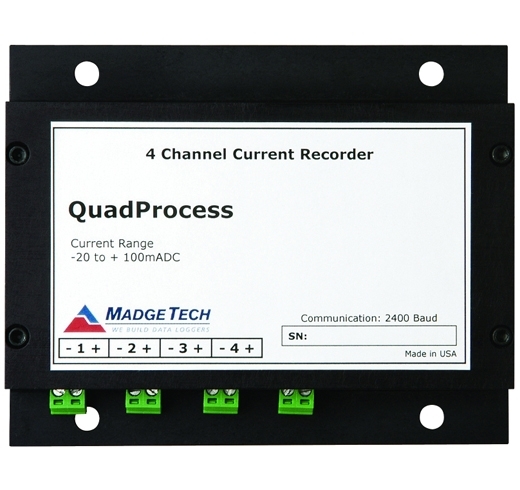 The QuadProcess makes data retrieval quick and easy. Simply plug it into an empty COM or USB port and our user-friendly software does the rest. PC software og USB kommunikationsboks, inkl. data kabel.